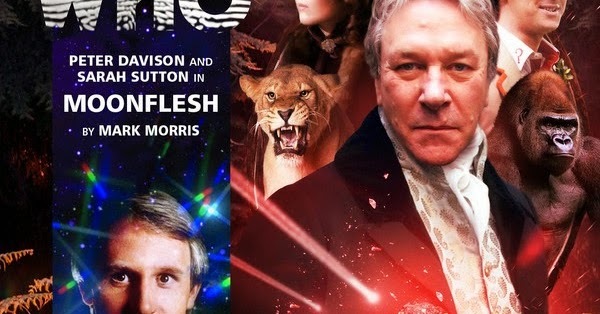 In 2014, Moonflesh began a new trilogy of adventures for the Fifth Doctor and his companion Nyssa. The TARDIS arrives in a Suffolk forest in 1911 and the Doctor is intrigued to hear an African Elephant's trumpeting call. But what is an African Elephant doing in the middle of a Suffolk forest? It doesn't take the Doctor and Nyssa long to find out. Author Mark Morris manages to successfully create a group of characters where everyone is larger than life. Normally, this would be a recipe for disaster as larger than life characters usually get on people's nerves but here, it really works. During the opening scenes, Morris nearly runs the play aground thanks to the constant comedy toffs constantly shouting at each other in over the top voices but thankfully, there is enough characterisation to stop this from happening. Nathanial Whitlock is loud but likable, with Edwin Tremayne, played by Hugh Fraser, comes across nicely as a self centred monster, the complete opposite of Whitlock. Another nice addition to this group of extraordinary characters is Hannah Bartholomew played by Francesca Hunt. Doctor Who fans may be interested to know that Hunt is the sister of India Fisher who rose to fame in the Who world with her portrayal of Eighth and Sixth Doctor companion Charley Pollard. It is Hannah who kicks the action off by trying to scrape off a piece of the Moonflesh for some samples and unleashes its terrifying true nature. As one has come to expect from Big Finish over their many years in business, the main cast are given plenty to do. Although kept together, the Doctor and Nyssa are paired off with different characters for most of this adventure. Peter Davison's Doctor spends most of his time with Silver Crow, who both explore the mystical side of the play. Silver Crow is also played masterfully by John Banks who makes a character that could come across as dull, extremely interesting! Sarah Sutton's Nyssa, fighting her way through the sexism of the early twentieth century, manages to assert herself despite being partnered with the weaker character of Phoebe, Nathanial's daughter. Something that Big Finish have managed to do with Nyssa is give her a chance to breathe. Both Nyssa and Tegan were great companions but in these audio stories, Nyssa really gets a chance to shine thanks to them being set between Tegan's accidental departure at the end of Time-Flight and her re-joining the TARDIS in the opening story of the next series, Arc of Infinity. Moonflesh fits right into the Davison era thanks to it's mystical elements like those seen in Kinda and Snakedance. And the story is greatly improved thanks to it's heightened reality and the great sound design from Andy Harkwick. This is a story that feels right for the era it is set and recreates it well and sets the bar high for future releases featuring the Fifth Doctor and Nyssa.